Happy Mother’s Day! Happy Draw a Bird Day! Some of us like to take the annual Draw A Bird Day celebration, brought to our attention here on WordPress by Michael Emberson of A-Wing and A-Way just over a year ago, and make it a monthly event. We help WordPress fly on the 8th of each month by posting our bird art, and by encouraging each other’s progress in drawing and painting birds. A special thanks to all my artist buddies who joined in today! This little painting is on a 6 x 6″ (notice I’ve graduated from 5 x 5″, yippee!) Gessobord panel. I will post a round-up of all of the bird artwork in a few days, so if you would like your work to be included, please leave a comment with a link to your post below. I want to thank Kerfe & Nina over at Method Two Madness for graciously hoisting the Draw a Bird Day banner for the last several months while work clipped my wings for awhile. I’ve returned with the Yellow Bird of Happiness! You may remember this little guy from back in September. (I’m slowly working my way toward some type of realistic acrylic painting, hehe.) 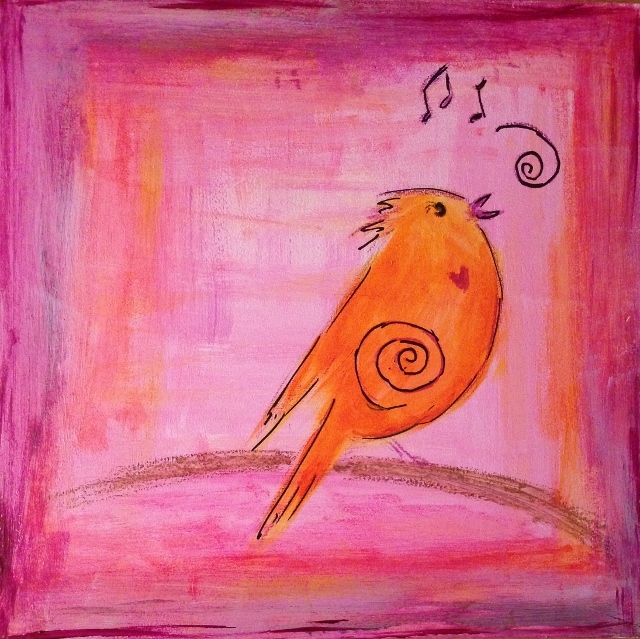 I really enjoyed playing with Golden quinacridone magenta, hansa yellow (medium and light) and transparent pyrrole orange, and a few Caran d’Ache neocolor II crayons helped me out with this little birdie as well. It’s not always easy to make time to create a painting each day, but I relish the opportunity to sit down and bring something to life. There’s something special about that! I’m learning a lot, and having fun. I hope you are too, and I hope all of the moms out there have a fabulous Mother’s Day today! Hug your little chicks today, everyone! I love celebrating Draw-a-Bird day. I wish I’d known about making it a monthly celebration. Hopefully I’ll have a chance to get out watercolors later today– we’ll be traveling again this morning — and create a feathered friend of my own. Happy Mother’s Day! Don’t worry if it’s not ready today; I’ll post my wrap up in several days. You’ve got loads of time! No pressure. Glad you’ll be joining us! I posted my snowy egret. The bird is finished…background not so much LOL. I’ll try to get busy on it tomorrow. It needs to be finished, and this will give me a little push to finish it. Awesome, just remember to post a link to your artwork here at some point so I will be sure to include it! I will make a note to do that, and as soon as I finish the background I will post the link. I updated my Snowy Egret. The background wasn’t turning out the way I’d hoped, so I used a bit of “digital paint” to complete it. He really wants to join the “flock”, so I hope you’ll include him for May. Thanks! Cute birdie! 🐦 Happy Mother’s Day, Laura! Thanks, Catherine, same to you! Love that this one has a whimsical touch. Happy Mother’s Day! Thanks, Kathy! Saturday got away from me and I didn’t have time for a realistic watercolor. Maybe I’ll conjure up something for my roundup post. Have a wonderful Mother’s Day! Thanks Stephen! I’m learning a lot about acrylics and hope to make another that is a bit zippier! So glad you enjoyed! He’s so cheerful. I think he would look great on a tote bag. I never had a tote bag with a musical theme. I never found one this cute all those years I was taking piano lessons, and toting my music to and from the lessons. Thanks, Deborah! I plan to open a society6 shop later this year and you just may see this one (or something really similar, I wasn’t quite satisfied with the way this guy turned out but it was late and I needed to get to bed) there! Love your hummingbird, it’s beautiful! Thanks for joining us! Oh neat! We’ll see another version of this cheery guy in the future then! I look forward to your Society6 shop! I see calendars, coffee mugs, tea cups, totes, scarves, and all sorts of textiles in your work. It’s my pleasure, Deborah and thank you for your encouragement and praise! You’re so kind! Enjoy the rest of the weekend! Thanks so much, Mary! I hope you have a wonderful Mother’s Day! Love your cheerful bird and post! Hope to post a bird I’m working on sometime today, cheers! Looking forward to it, Michelle! So exciting! Birds are so much fun to try and paint and draw! What a chipper little bird, chirping away in it’s own little world. Yay for sun! Thanks for popping by Rebecca! The sun is actually out here, too, it’s been raining for days (and will rain again tomorrow). I think I would love the UK but some people are going crazy never seeing the sun here! Gosh so much rain is going around this year for everybody…..we should be sending it to Canada, they really need it more. True. When someone is getting too much, usually someone else is getting too little. Here’s my “Irritated Birds” post! Beautiful birdie, Laura! Sorry I was not able to participate this time. Happy monthly Draw A Bird Day! And a wonderful Mother’s Day as well! Thanks, Michael! So glad you enjoyed it. Thanks again for giving us the bird word! It was terrific! Our daughter and her boyfriend surprised us with a visit! 💜💜💜 Glad you had a good day too. Thanks Denis! They’re like little joy machines! Thank you! Love your painting! This. Is. Adorable. Thank you!! Corinne, thanks for dropping by! I won’t post the roundup for a few more days, you still have time to get your bird posted. When you’re finished, just put a link to your artwork here and I’ll include it! I was already starting a post to show the current state at least. But I will take a little more time – both on the bird(s) – it’s a two birds painting – and the post. Thanks so much for the quick response! Sure! Thx for joining in! Thanks Beverly! Love your bird, glad you joined us! Thank you Stephen! Will be so happy to include your work in our roundup! I’m so glad she is ok and thanks for the link, Susan! Oh yay, the yellow bird of happiness is back :-)! I love the yellow and magenta combo – very cheerful. The background is lovely. I’m enjoying the textured look of your acrylic paintings. The way the colours vary within a square framework creates fun and interesting colour shifts and beautiful depth. Now I want to try acrylic paint! But I’ve barely used my watercolours… so I will focus on those instead. Thanks so much, Myriam, and thanks for your link & for joining us! He is a cutie, I can hear his beautiful song! He is a chirpy one! hehe! 😀 I’d like to redo this one now that I’ve learned a little more about acrylic brush strokes. So much to learn! I hope you’re enjoying DE! Thanks again for hosting the draw a bird day! Sweet post! I tweeted it. Aw thanks so much, Margaret! I’m kind of late to the celebration, but early enough to do something for June 8!